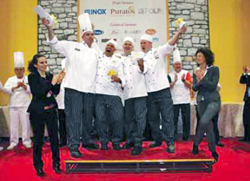 Team Bakery Australia at the International Bread Baking Championship, Italy 2009. 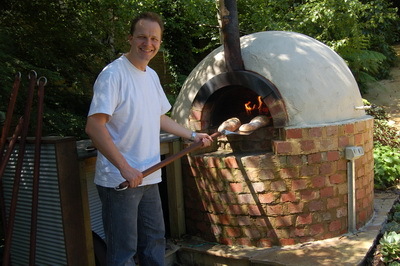 That same year, he was granted a Skills Victoria/International Specialised Skills Institute Fellowship and got to spend time touring the US and Europe researching the latest bread techniques. Drawing on all his knowledge and experience, Scott has designed a wonderfully detailed Advanced Bread Section for us, comprising of three separate units (as they say in the teaching profession!). 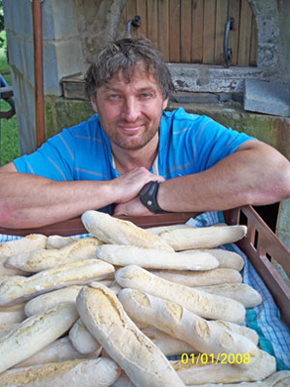 This maxi/mini-course not only provides a bit of an insight into the sort of learning a qualified baker would undertake during his professional training, it will provide you with a platform of knowledge to enable you to confidently write your own professional standard bread recipes but to do it in a backyard context so you can get the best out of your oven – giving you the best of both worlds! Flour provides a source of natural sugars, which are required to feed the yeast. 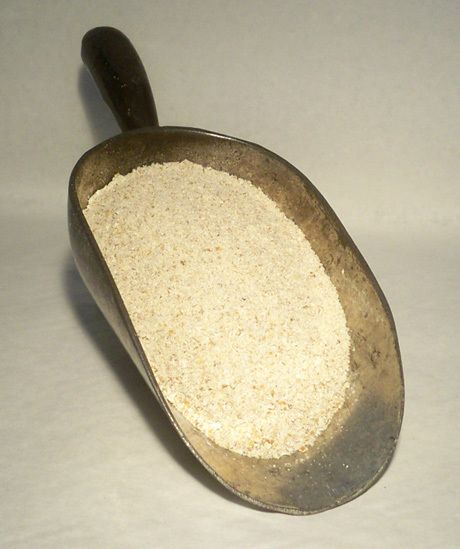 With the addition of water, around 70% of the carbohydrates contained in flour breakdown to simple sugars that are then available for the yeast to digest. Flour is the source of gluten-forming proteins, which provide a 'mould' or 'framework' for the bread - it is the long strands of gluten-rich protein that initially hold the bread in shape. It is only in the oven that the starch around the protein sets and forms the loaf. At the same time during baking, the protein framework gelatinises and softens and thus ends up providing the bread with its chewy characteristics. 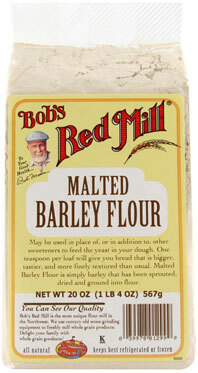 THE BAKER'S TIP: "Because your flour forms the structure of your bread, always use a good quality, high protein flour. 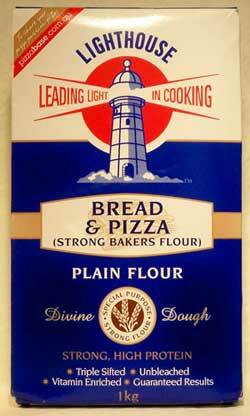 These are usually marked Baker's Flour or Pizza Flour, but to be sure, look at the nutrient panel on the product and check that the protein content is over 11 grams per 100 (i.e., over 11%)." 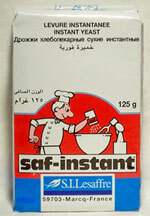 Salt provides flavour. 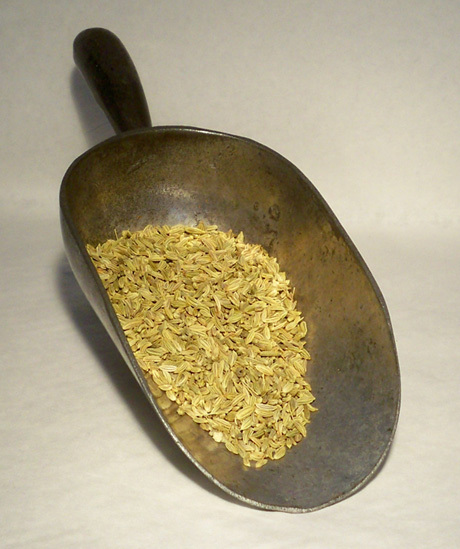 Unless another flavouring, herb or spice is to dominate, bread without at least some salt lacks taste. Salt helps to control the speed of fermentation. This can be particularly useful in our hot climate (here in Queensland). If the day is warm, adding more salt to the mix will help retard the massive growth that will occur during the first dough rise and give the dough time to develop some strength and complexity. Keep in mind though that you'll be able to taste any salt you add over and above about 2% of the flour weight in your dough. 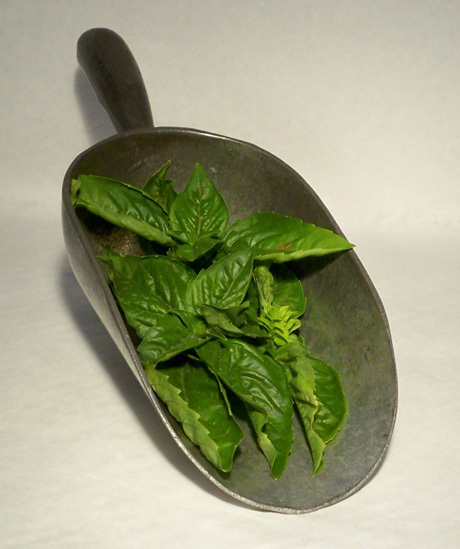 Salt strengthens gluten development. If after mixing, your dough appears slack and lifeless, the first thing to check is to make sure you've added your salt. Without it, your dough will lack body. You can add your missing salt to your dough mix easiest by dissolving it in a little room temperature water. 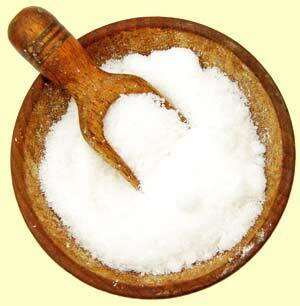 THE BAKER'S TIP: "There are many myths about using salt in bread, usually to do with when it should be added in. 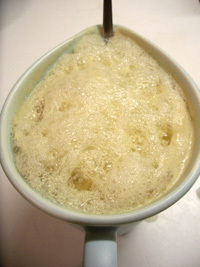 There does not appear to be any real difference as to whether the salt is added in the water or not, or kept separate from the yeast or not. My personal preference is to add it right at the start, but that's just so I don't forget to add it later!" Fats and Oils prolong the keeping qualities of the bread by both inhibiting the crystallisation of the starch and stopping the evaporation of water from the loaf. These two factors are what cause your bread to harden and become stale over time. Fats and Oils increase the volume of a loaf by acting as a 'lubricant', allowing the ingredients to 'slide' across each other during proving. THE BAKER'S TIP: "You can test the volume-increasing qualities of adding fat or oil to your mix by making two loaves of bread essentially the same, but adding fat/oil to one loaf - that loaf will be noticeably larger." Yeast is the activator of the bread story. 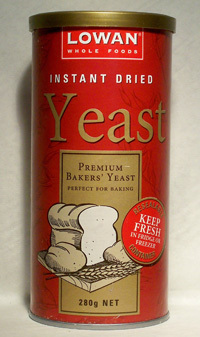 It is available in several different forms but dry (sometimes called instant) yeast is the norm. Whatever form is used, freshness is the key to quality and so watch the expiration dates closely and if you are using dry yeast, keep it in the freezer. Yeast provides the source of the carbon dioxide (through fermentation) which is what makes the bread rise. Yeast is the main source of flavour and aroma and thus essentially, makes bread 'bready'. 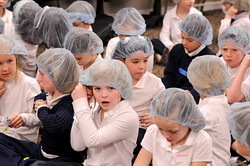 Yeast determines the speed of dough maturity and aids with the conditioning of the dough. THE BAKER TIP: "Dough condition refers to the dough's 'ripeness'. If you think of the dough as a piece of fruit, if it hasn't enough yeast or the yeast hasn't been allowed enough time to activate, then the dough will be hard and bitter. With enough time, there will come a point when the dough is perfect and flavoursome and if you go past that and leave the yeast to ferment too long or if you've used too much yeast, your dough will be very soft and start to taste bad." Water makes the dough consistent and disperses the ingredients evenly. Water controls the finished dough temperature. The issues around controlling the dough temperature will be explored more fully later in the lesson on Method, suffice to say that the easiest way to manipulate the dough temperature is by controlling the water temperature. THE BAKER TIP: "On average your bread will have a water content of around 60 to 70% of your flour weight (600 to 700 ml per kg of flour). If you are using machinery to mix your dough, it's likely that the percentage will be down around 60%, if you are mixing by hand, it'll probably be around 70% and rustic loaves with large bubbles of air (like ciabatta) can have a water content as high as 85%! The reason that you get larger air bubbles in higher water content dough is because the slacker the dough is, the more yeast activity will occur..."
Bread improvers are a relatively new addition to bread making, being one of the chemical processes adopted as part of the post WW2 industrialisation but, at least commercially, they are so frequently used that they straddle the line between Main Ingredients and Other Common Ingredients. Prior to the massive changes that occurred in commercial bread making at that time, baking Artisan Bread, using traditional methods of pre ferments (more about them later! ), was a two part process and took a minimum of 4½ hours to accomplish from start to finish. 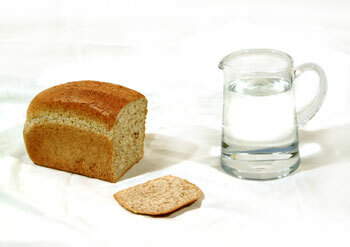 When it was discovered that a combination of ascorbic acid (one of the main functional ingredient in all improvers) and certain other additives (like emulsifiers and conditioners) could be used to speed up the bread making process, it soon became possible to make bread in literally half the time. 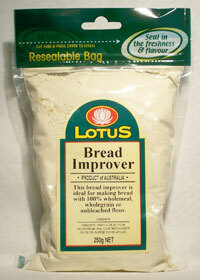 Commercially, bread made using an improver is usually referred to as 'instant' or 'rapid rise'. It is also possible to buy bread improvers from some supermarkets and health food stores. Lowe's brand bread improver is probably the most readily available in Australia if you want to try using an improver in your own bread. Eggs are added to enrich the dough by increasing the protein and fat content - think brioche or panatone or other rich/special breads like Greek Easter bread (streki/tsoureki) or Jewish challah. 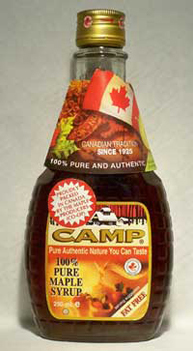 Following America's lead (from the 1930's onwards, the USA began a program of fortifying common commercial food products with vitamins and minerals) and in response to the high rate of calcium deficiency amongst the Australian population, after the second World War, a law was passed making it mandatory for all commercially marketed refined bread to contain added skim milk powder. 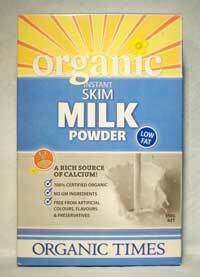 It is no longer compulsory for manufacturers to do this (though new laws making it compulsory to add folic acid and iodine to refined breads were introduced in 2009), but the convention of using skim milk powder is still common. 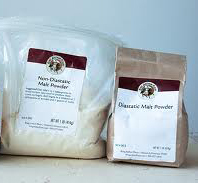 On a practical level, because lactose (the milk sugar) does not ferment, skim milk powder does help to add a certain sweetness and richness to a dough. 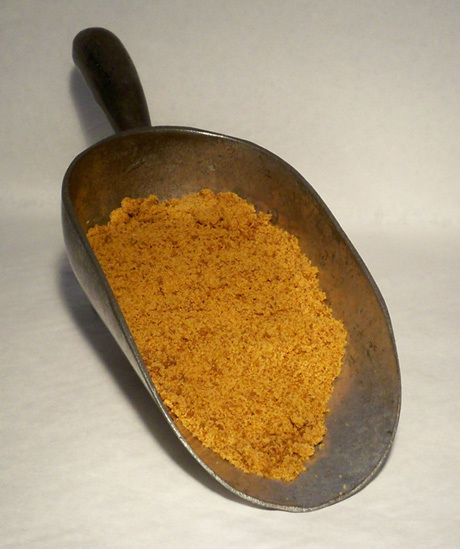 It also assists in creating a nice, golden crust colour on your loaf because the unfermented/unused milk sugars near the surface of your loaf, like all sugars when exposed to heat, caramelise and brown. Soya flour is a natural emulsifier and thus is really useful to help the fat and the water in the mix combine into a really smooth dough. Traditionally, because the amount of gluten contained in flour varies significantly across species, growing regions and with the seasons (for instance: summer wheat grows much more quickly and so the gluten structure of the flour made from summer wheat is often much weaker then winter wheat), bakers looked for ways to ‘even out' their batches. Adding extra gluten (and using bread improvers) helped to accomplish this. In addition, a small percentage of extra gluten (up to 2%) is often added to heavy loaves (particularly those full of fruit and seeds) to help strengthen the dough and hold the fruit and seeds up so they don't sink to the bottom of the mix. If you are adding additional gluten to your loaf, you need to be aware that one of the characteristics of gluten is that it holds its own weight in water, so you would need to add the same percentage increase to your recipe's water content. Obviously, sugar is added to make a sweet dough, but like fat, it is also useful because it slows down the rate at which bread hardens and goes stale. The average sugar content of a sweet bread (like fruit loaf) is 12% of the flour weight, though some dough (like doughnuts) can contain up to 20%. 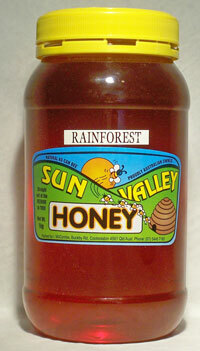 Other sweeteners can also be used of course, particulary honey and maple syrup. 1 Non-Diastatic Malt Flour is created when the malt grains are allowed to grow and are then heated before being ground down into flour. The addition of this sort of malt flour results in a sweeter, softer dough and as the flour itself has no enzyme activity, it also provides another sugar source for the yeast. 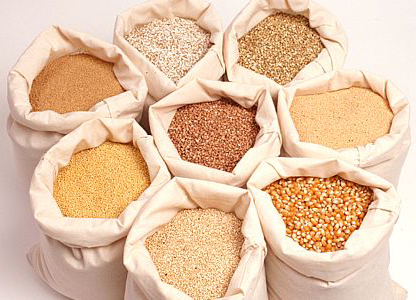 2 Diastatic Malt Flour is created when active malt grains are processed without any heat. The resulting flour is full of enzyme activity (unlike the flour above) and will help enliven a sluggish dough. 3 Toasted Malt Flour is just flour made from toasted malt grains, however it's nutty flavour and colour makes it a desirable addition to bread dough because it makes the dough look and taste more wholegrain/fibre filled. Once you understand these ingredients and their purpose, you can begin to create your own bread recipes AND also, you can adjust recipes to create desired results. Effectively, you can troubleshoot your own bread and have exactly the qualities in your loaves that you want. Of course, whilst understanding your ingredients will help you make great bread, the key factor in developing your own recipes is consistency – you need to be able to accurately measure your raw materials and create a formula balance (so that the ingredients used in a recipe remain in the same ratio, irrespective of the size of the batch you are making). Being able to do this is what allows you to be confident your bread will turn out every time and also allows you to be able to communicate your results and pass them on to other people. THE BAKER SAYS: "Bread making is a science that relies on various ingredients being present in specific quantities so that certain chemical reactions can occur at measurable speeds. 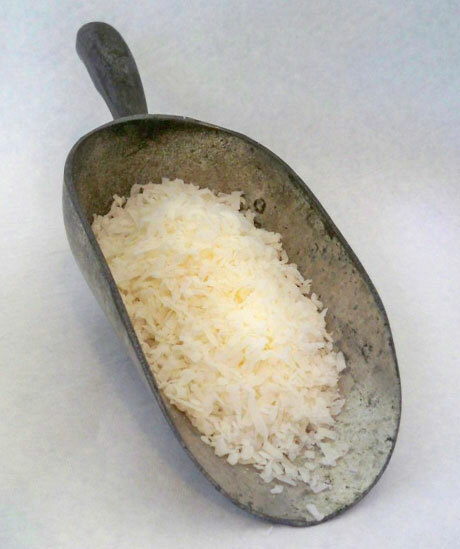 Variations of ingredients and quantities can have a dramatic effect on your bread dough and final bread products and while amazing new ideas and methods can result from happy accidents, if the quantities are unknown, the happy accident cannot be converted to a new recipe anyway, so – ALWAYS MEASURE YOUR INGREDIENTS". Because measurement and proportion are so important in the baking process, Baker's write their recipes as formulas and they use a technique known as the Bakers Percentage. That is: they write their bread recipes out in mathematical form and they express the flour quantity as100%. 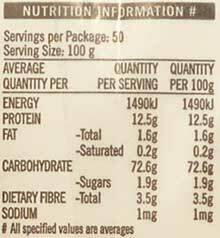 All other ingredients are then described as percentages of this flour weight. To make a batch of bread using the formula, the first thing you need to do is to convert the formula from Bakers Percentage to a Per Kilo Flour Weight formula – remember, bakers base all their ingredients on flour weight. To do this we simply multiply the flour weight by the ingredient percentages. Please Note: one of the side effects of using the flour weight as the basis for the formulas is that liquid ingredients then need to be measured by WEIGHT not VOLUME as would normally be the case in other recipes. Try working out a recipe yourself for a batch using 5 kilos of flour. 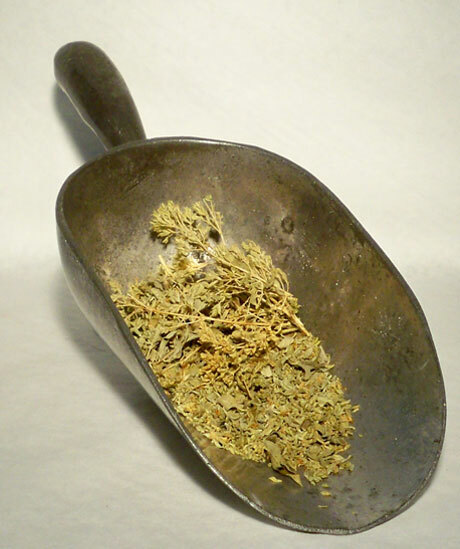 Check the results you got for your 5 kilo batch above. Click on show... (at right) for a handy tool you can use to automatically calculate out your dough batches based on your chosen flour quantity. Please Note: most mistakes made using the Baker's Percentage happen because figures have not been written down correctly or either the zero or the decimal point has been left out or put in the wrong spot. You will also notice from the tables above that by adding up the kilo weights, you can get a total weight for your actual batch – this can be very useful for working out how many individual loaves or buns, etc. a particular sized batch will make. When discussing recipes though, be careful not to get confused between the flour weight and the actual dough weight. This basic bread formula can be adapted in many ways to make many different styles of bread and though there are accepted ratios of one ingredient to another, individual recipes can vary to quite a staggering degree. 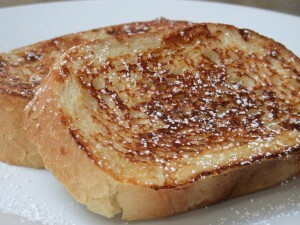 For instance: Brioche is a very rich, sweet, traditional French bread (often used to make French toast in fact!). 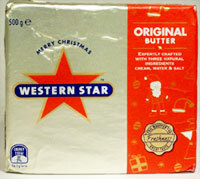 To make it, essentially you adapt the formula above by changing the oil to butter. The percentage of butter to flour in brioche recipes can be as high as 60% - and likewise, the egg percentage could rise as high as 60% and there may be up to 20% sugar – a pretty decadent bread indeed!, but still easy to express using the formula method. 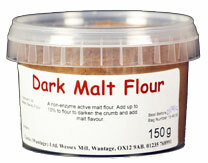 In bread making, a combination of two or more types of flour is often desirable for flavour, texture or appearance. This is easily expressed using the Baker's Percentage method. You just need to ensure that the total flour weight is still 100%. As well as these fairly readily available flour types, using a home mill or buying from a speciality mill or health food shop with a mill, it is also possible to grind or get quite a few different grains ground to your specifications and in the quantities and ratios you desire. These speciality flours and mixes are particularly useful in advanced and speciality bread making, where a combination of two or more types of flour is often desirable for flavour, texture or appearance. These combinations are easily expressed using the Baker's Percentage method. You just need to ensure that the total flour weight is still 100%. 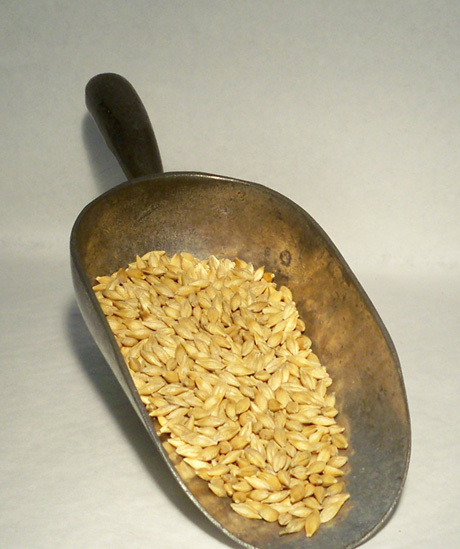 Whilst we have touched on the different types of grains used to make flour above, it is also quite common to include whole, kibbled or flaked grains in bread as well. These grains can either be calculated in the flour weight itself or alternatively, they can be included after it (with the salt, oil, etc). For the record, a standard loaf is usually made from 780 g of dough. Big bread rolls require around 80 g, and dinner rolls and small rolls are usually made with about 65 g.
Due to the evaporation of most of the water in the dough, the weight of the finished bread is always lighter. Your standard 780 g dough weight bread for instance will yield up a 680 g finished loaf. The other way to use the figures is of course to work backwards. You can start with what you want to end up with and work back to see how much of your ingredients you will need to make a batch of a certain size. For instance, if I want to end up with enough dough in my batch to make 10 x 1 kg loaves, using the formula above (where my expected yield percentage is 168.5%), that means a dough batch of 10 kilos represents 168.5 % of my flour weight. This means that my flour weight should be (10 divided by 168.50 x 100 =) 5.934 kilos, my salt weight should be (5.934 divided by 100 x 2 =) 0.11868 grams (rounded up to .119 here and to 12 or possibly even 15 in your receipe! ), etc. 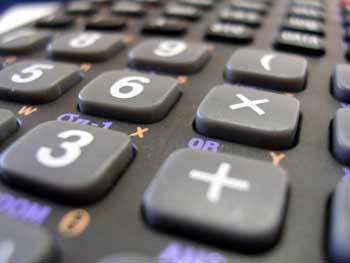 See if you can calculate out the rest of the formula for the 10 x 1kg required yield batch. Click on show... (at right). Dough Total: 168.5% 9.999 kg (NOTE: a good way to check if this calculation is correct is to add up the individual totals you get (here 9.999 kg) and see if that figure really is the dough total percentage (here 168.5) of your flour total (here 5.934). As well as whole and kibbled grains, there are obviously a multitude of other ingredients you can add to your bread mix or sprinkle or roll over the surface of your uncooked loaves (and thus, they should be weighed and include in your recipes). These ingredients would not form part of the flour weight, but their size and moisture quantities (and their temperature – more about that later!) must be taken in to account. It is also often necessary/desirable to cook, soften or soak some of the ingredients in advance. 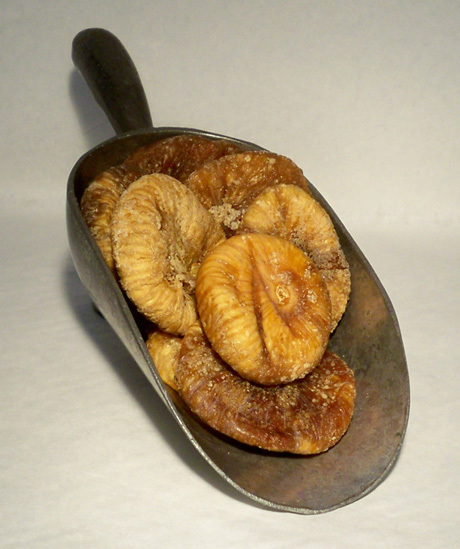 For instance: dried fruit is usually soaked in some form of liquid overnight before use, vegetables are usually cooked or cut up very finely and all protein additions should be cooked and their condition closely monitored. For the final session of our Advanced Bread Making Class, we'll be looking at the actual chemical and physical processes involved in making good bread – what you would refer to in a recipe as The Method. The goal is not just that you know what each process is, but what it accomplishes and how to adjust it. Again, as mentioned in Part One, it's having this knowledge that allows you to adapt basic recipes to suit your needs and to be confident that you can rise (hyuck!) to any bread making occasion. 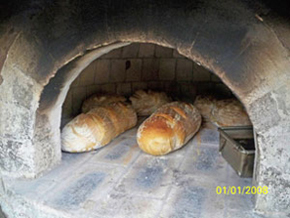 The processes of bread making are – fermentation, mixing, moulding and shaping and baking – but, as you will see, some of the processes have several stages and these are performed out of order. We will put all the processes and stages together into a time line (the method) at the end of the section. Fermentation is the chemical process at the heart of bread making. It refers to the conversion of starches in the flour to carbon dioxide, alcohol and heat. One of the central 'truths' of baking is that the longer you can leave your yeast and flour and water together, the better the taste of your dough. You would think then that the longer your dough had to ferment the better it would be, but this is not the case. Think of your gluten strands as being like rubber bands. New rubber bands are lovely and stretchy, but the longer you leave them laying around, the weaker they become – over time, the gluten's structure breaks down and it won't hold the fermentation gases anymore – so, whilst you want great tasting, full-flavoured dough, you also have to ensure that your dough is in optimum condition when it hits the oven. To overcome this, a variety of methods have been developed to impart the flavours associated with a longer mellowing time into the dough, without risking the 'health' and structural integrity of the batch (what professionals refer to as the 'dough tolerance'). These methods all involve some sort of advance preparation of a portion (up to 50%) of the batch of dough you are working on and then leaving that portion aside for an amount of time (up to 18 hours) before incorporating it into (or making the rest of) the main dough batch. Please note: if you are using a pre-ferment method, it is not usual to use a bread improver as well. Poolish is the technical term for making a pre ferment using a proportion of your total flour weight and mixing it with an equal quantity of water (i.e., the same weight of water as flour, not proportionally balanced quantities as per the overall recipe) and then adding a small portion of yeast (see Amount of Yeast further down in this Section) and leaving the resultant mix to develop in flavour. The particular advantage of using the poolish method is that, because it is such a moist mixture, one of the enzymes in the flour (protease) becomes really active and it increases the elasticity of the dough. This makes it a useful method to use if you want a final dough that will stretch well, for instance: for baguettes, where you want to stretch a small piece of dough out into a long, thin shape. A Biga is nearly the same as a Poolish but the water content is only 50% of the flour weight (see Amount of Yeast info below) and because of the lower water content, it needs to be mixed by machine. It is used when you want a strong but relatively tight dough, one that will hold its shape well, for instance: when making a Vienna loaf – the loaf is only loosely structured but some height is still required and the Biga will help provide that stiffness. A Sponge falls between a Poolish and a Biga, in that it needs a 60-65% rate of hydration (see Amount of Yeast info below). Likewise, it needs mid level mixing - either a light machine mix or a good knead - to get it to come together. It is frequently used with dough that has a high sugar or fat content as both sugar and fat are softening agents and the Sponge's stiffer consistency will help to counteract that. You would use a sponge pre ferment when making boston buns, brioche or coffee scrolls. For each of these three first methods, the Amount of Yeast you add depends not on the recipe you are using but on the amount of time you are going to leave the pre ferment aside. If you are going to leave it to develop for three hours, use 1% (of the flour weight you are using to make your Pre Ferment) worth of yeast, for six hours – 0.6%, for 10 hours - 0.5% and 18 hours -0.1%. Similarly, for each of these methods, the amounts of flour, water and yeast used in the making of the pre ferment need to be deducted from the amounts used to make the rest of the batch when you go on to complete it. Also, please note: no salt is used in any of these first three methods, that is unless you are right up north in the hot and humid tropics. Up there, you can add 0.1 – 0.2% of your pre ferment flour weight in salt to slow everything down enough to make the technique of pre ferment worthwhile. 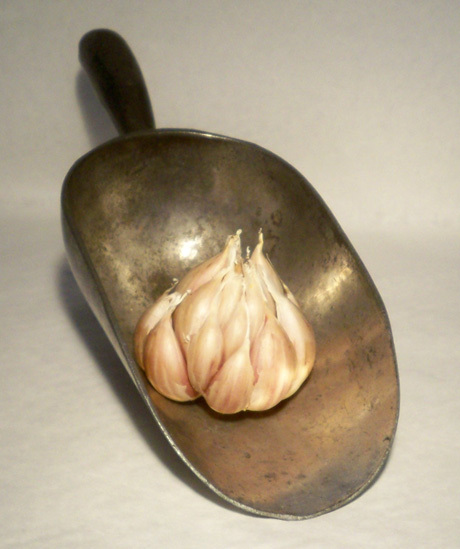 Pate Ferment is the term for incorporating some of an old dough into a new dough. This adds a greater complexity of flavour to the finished product. 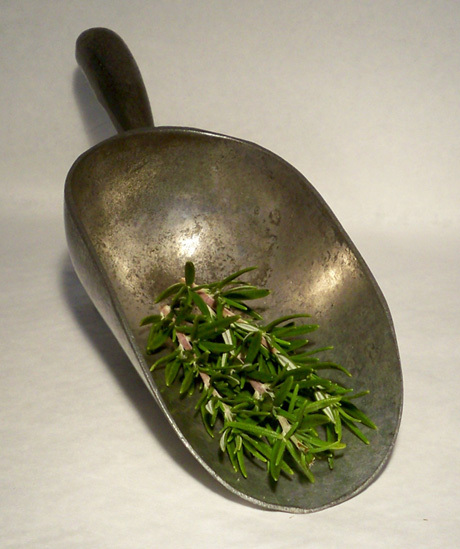 Use of a Pate Ferment is all about taste. 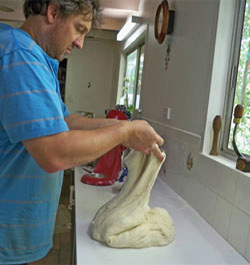 No particular extra quality is imparted to the dough (like strength or elasticity) but if the method is followed with each succeeding batch of dough, over time, the complex flavour that develops will be unique to the baker. The term FIRST FERMENT refers to the time the dough batch is left to develop as a whole piece. The term SECOND or INTERMEDIATE FERMENT refers to the time the just divided and pre-shaped individual loaves spend developing. 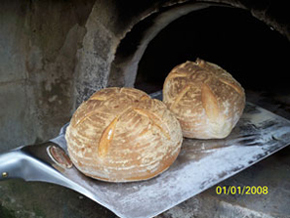 The term THIRD FERMENT or RESTING/RELAXING TIME refers to the period of time after the final loaf shape is formed and the loaves are left to reach maximum gluten development and are ready for the oven. 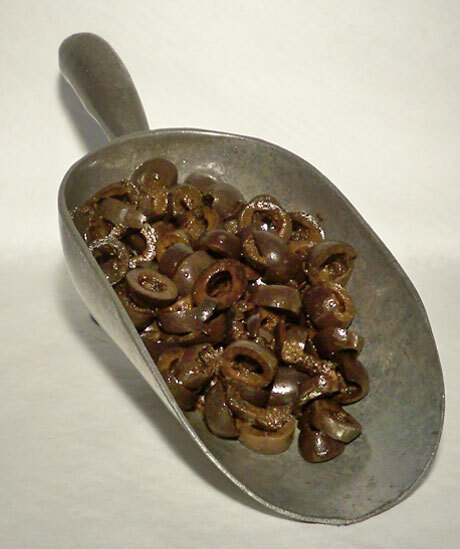 The other factor which really affects the rate of fermentation is the temperature of the dough, particularly the temperature after its final mix, just as it comes out of the bowl and is left to rise for the first time, which is of course when the bulk of the fermentation process occurs. If the dough is too hot, the yeast organisms will grow too fast and fermentation tolerance will occur before the proper balance of strength and flavour has been reached. If the dough is too cold, the yeast will be sluggish and fermentation will take considerably longer. 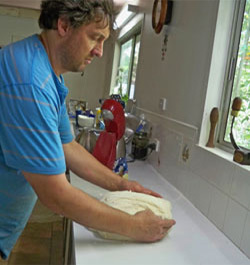 If the dough is just right, then the yeast will be nicely active and you will get a good rise in your first ferment and well on your way to making a successful batch of bread. Room temperature varies more than you think, so it's handy to have an accurate reading from the actual spot where your dough will be left to ferment. THE BAKER SAYS: "Most of us have heard it said that dough needs to be ‘protected from drafts', but this is not a reference to it being susceptible to cold, it's actually because wind blowing over the dough will form a skin and interfere with the rising of the dough". Obviously, flour taken from the fridge or freezer will be colder than flour stored at room temperature, however knowing and using your flour temp allows you a degree of control – on a hot day or in a hot kitchen, starting with cold flour can help ensure you end up at the optimal dough temperature (as per below). Obviously, the temperature of the water in the dough is the area where you have the most control – there's a lot of water in bread dough and it is easy to establish and adjust the temperature of it. Because of this, the water temperature is the key to controlling the fermentation process. Below is a formula for calculating the water temperature needed to end up at optimal dough temperature. As a general rule of thumb though, your water temperature shouldn't ever be over 35 – 38 degrees Celsius. If a water temp higher than that is needed to reach optimal temperature, cooling down the flour is the next best alternative. To accurately predict your dough temperature, you must also monitor the temperature of your pre ferment (if you are using it) and also calculate the friction factor of your mixing method. Clearly, if you are hand mixing a small batch of dough, calculating temperature on this scale is overkill and the 'friction factor' is negligible. If this is the case, don't fuss too much, but bare the 23oC to 26oC ideal range in mind. If however, you are using even a domestic Mix Master or any sort of other machine with a dough hook, the friction factor of the machine will have an effect on your final temperature. To measure it, take the temperature of your dough before mixing (there will be more about mixing later, don't worry!) and then run the machine at the correct speed for 2 minutes and take the temperature again (NOTE: see Mixing Section to follow, the machine should be running at dough development speed during this time). The difference between the two temperatures is your machine's friction factor. Final desired temp 25oC, less friction factor of 4oC = 21oC times 4 = 84oC. Room, flour and preferment temp (25 + 20 + 18) = 63oC. Gives a necessary water temperature of 21oC. It is advisable when making serious batches of bread to always ensure your flour and water are mixed together properly before anything else occurs. The technical term for this kind of 'pre-mixing' is AUTOLYSE. If you're using a machine, allow the dough 4-5 minutes on slow speed for the flour to properly hydrate and blend with the water. If you're mixing by hand, after you've incorporated the flour and water to the point where there are no lumps of dry flour visible, leave the mix sit on the bench for a minimum of 20 minutes to allow the gluten structure to develop without wearing yourself out. This autolyse process is so beneficial to enhancing the chemical activity of the dough that you may want to extend the time you leave the flour and water mix standing. Regardless of whether you have autolysed by hand or machine, after the mix is smooth, you can leave it stand in its bowl, covered with a damp tea towel for up to 24 hours. Bakers (and baking literature) often confuse the pre ferment and autolyse processes. Both processes are beneficial and can be done to the same batch, however for the home baker, realistically, doing both a poolish and then autolysing the same batch is very difficult because you will have to amalgamate a very wet dough into a very firm one (the polish having most of the recipes water content in it). Similarly, autolysing for longer periods of time makes accurate temperature calculations difficult. As a rule of thumb, a 20 min autolyse will not affect a temperature calculation overmuch, but if you are doing a 24 hour autolyse, any temperature calculation will be meaningless. That said, the ultimate aim is still a dough temperature that will assist fermentation. So the theory of temperature calculation is still sound in that, if your autolysed mix and all your other ingredients are at room temperature (and you know what that is) and you take into account your friction factor, you will have a fairly accurate idea of whether your batch temperature is lower than 25 degrees or not. If it is lower, then you need to allow for an extended proving time. If it is higher (that tropical weather again!) then a shorter proving time will be required – do not be afraid to 'take your dough's temperature' to establish if it is at or close to the ideal fermentation range and, once you know that, use that knowledge to adjust the situation closer to the ideal range. 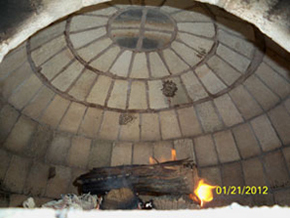 For instance: in particularly cold climates, dough may need to be placed in a partially open, warm oven or in front of a fire to prove. 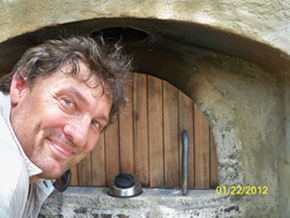 In warm climates, moving your dough to a cooler (maybe even air conditioned?) room, or onto a tiled floor or wherever the coolest spot in the house is, may do the trick. After the pre mix/autolyse stage, the next part of the mixing process is called INCORPORATION. This is where the yeast and salt are incorporated into the dough. The sugar and fat content of the mix (if they are being used and if they are under 10% of the flour weight) may also be added here, though any quantity of sugar or fat over the 10% mark should not be added here, but should be left till after the dough development stage. Nuts, grains and other chunky items should also be left until after the dough development stage before they are mixed through. 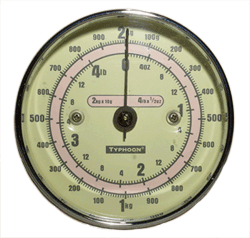 On a standard commercial or domestic mixer, incorporation takes a minimum of 3 mins on first or low speed. If you are mixing by hand, then you should probably spend around three to five minutes mixing. 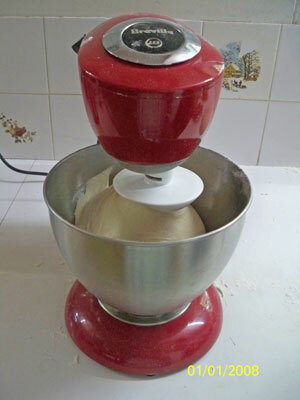 It is nearly impossible to over mix by hand as by the time the mix is sufficiently incorporated, the dough will be starting to form a ball and it will be nearly impossible to continue to stir it around in a bowl and/or without changing to a kneading motion. 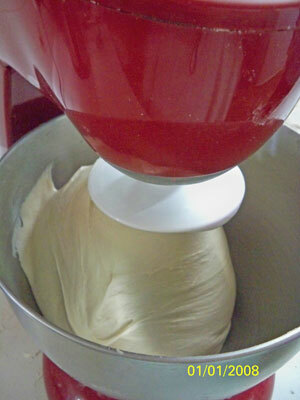 The final phase of the mixing process is called DOUGH DEVELOPMENT. The actual mixing time in this stage is dependent on the level of gluten development required in the bread. Commercially, second speed is used, which translates as mid speed or no. three or four on a domestic machine, or at least 10-15 minutes of work if kneading by hand. 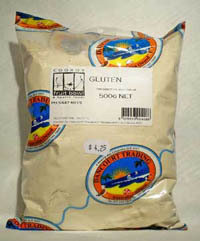 If you use the Short Mix time, your gluten structure will be under developed. This is not a bad thing, however! 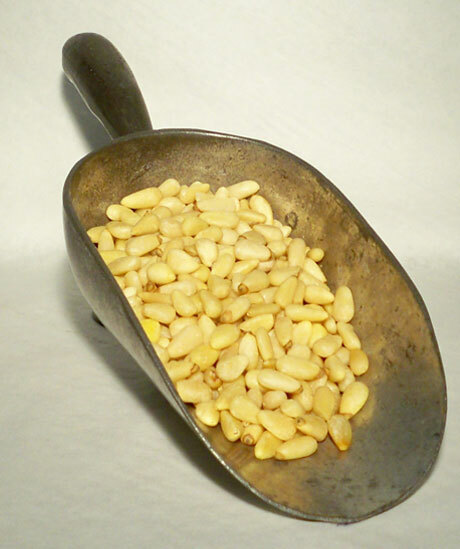 It means that you will have a nice open irregular crumb, a creamy colour, a complex flavour and a longer shelf life. There is a specific technique too that optimises the strength of your dough if you mix it using the Short Mix method. It is called 'Lift and Fold'. After you have mixed the dough, when you put it aside to develop, the ideal time for a short mix to be left to ferment is 3 hours, 45 minutes. During this time, you treat the dough like pastry, in that, every 45 minutes, you lift a different side of the dough and place it over on the opposite side, smooth it down and set it aside again. 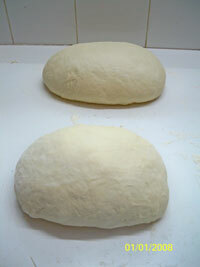 1: From the sides, pick up one end of your dough. 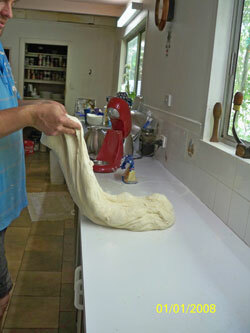 2: Lift and stretch out that side of the dough. 3: Fold the stretch piece over. 4: Smooth the dough gently back into shape. 6: 45 mins later, turn the dough ¼ turn and repeat process. Do this 4 times. It is particularly important to use the Lift and Fold method if you are kneading your dough by hand as the standing time and the folding really increases the level of gluten development that occurs. 100% gluten development is nearly impossible to achieve when mixing by hand, but the Lift and Fold method will significantly increase the percentage possible. The Intensive Mix technique is the method developed with the coming of really serious industrial bread making and bread making machines in the 1950's. It results in a tight, white, fine crumbed bread in which the gluten is fully developed and the volume is maximised. Because of the intensive mixing, the first fermentation time is only around 15 minutes. This method is the most commonly used method in commercial and/or industrial bread baking, but is not really used in Artisan or home baking. The final option, the Improved Mix technique is the most commonly used method in professional Artisan baking because it sits between the two other techniques and so has the benefits of the short mix method but also some of the volume and gluten development of the intensive mix, yet it doesn't take the time or involve as many processes as the short mix way does. The ideal first fermentation time for an improved mix dough is about one and a half hours. No lifting or folding is required. 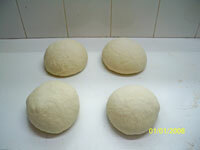 These three accompanying photo's show the difference in the look and elasticity of dough mixed using the three different techniques (Please note that the photos are taken at the end of the mixing time, before any techniques, like the first ferment or lifting and folding have occurred). In general, you can use any of the three methods to make any style of bread (unless as previously stated you are mixing by hand, in which case you would use the short mix and the lift and fold method). The difference shows primarily in the crumb structure. If you are after a closed, tight structure (like a commercial white loaf), you would use the intensive mix method, for a very open structure, you would use the short mix and the majority of the time (provided your mixmaster can stand it!) you'd use the improved mix. 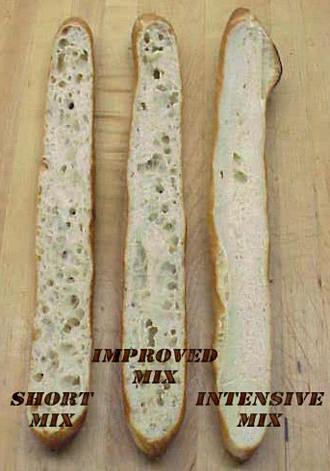 This photo shows the difference in the finished texture of the bread using each of the three methods. Just a reminder too that high sugar and/or high fat content amounts or any chunky grains, seeds or other ingredients should be gently mixed through at this point (the end of the dough development stage, but before the first ferment or any lifting and folding occur). 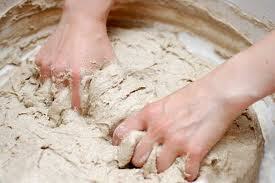 Moulding and shaping the dough is another very important process in bread making. It not only determines the final shape of the bread but also effects the internal cell structure and texture that it will have. As with mixing, there are several steps in the process. When dividing the dough into parts, a single cut piece of dough the size of your loaf (for example: 750 grams is a generally considered the right size for making a Vienna bread loaf) will produce a better loaf of bread than lots of smaller dough pieces combined together. Also be careful not to tear or stretch the dough during the dividing process – gentle arranging/lengthening of the dough mound on the bench, so that a single clean cut severs each piece, is preferable. The pre shape is the shape the dough is arranged in after the dough is divided as above and before it is left for its second ferment. The pre shape should be fashioned in a similar form to the final shape. For example: a French baguette pre shape is a lightly formed short cylinder, a Cob or Boule is rounded into a lightly formed ball and a Vienna loaf into an oval. Once the pre shape is formed, the dough should be allowed to rest again for between 15-30 minutes to allow the gluten in the dough to relax. 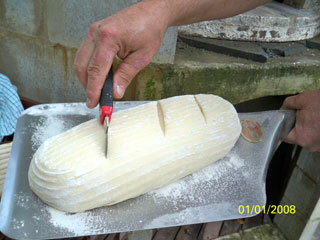 This important step will make the final shaping easier, with less contraction of the dough. The length of time the dough is left to prove at this stage will depend on the dough characteristics. If the loaf is really tight (for example, if significant pressure was exerted making the pre-shape or if the dough itself was underdeveloped and slack and so it needed to be worked more than anticipated at the pre-shape stage), then the dough can be left to rest longer, if the dough is lively but loose, it may only need the 15 minutes. After the dough has relaxed from the cutting and pre-shaping processes, it needs to be gently reformed or rolled into its final form. 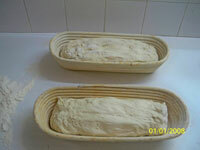 Depending on the loaf, sometimes the final shape is formed in a container (which the bread is then baked in) or by placing it into a mould (like a traditional banneton or dough proofing basket) or by temporarily using a tea towel or other device to hold your loaves or buns in a particular shape until they are ready to bake. If the dough is staying in a tin for both moulding and baking, the container must be oiled. 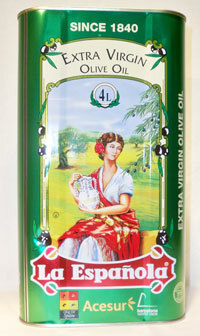 These days, spray oil is the most popular method as it gives such a light, even coating to the container. If you are using a banneton basket or some other holding structure or tea towel divider, these items usually need to be very well floured, so that the dough comes out easily onto the peel or stone. The final shaped dough piece should have a smooth tight skin without any tearing, holes or irregularities and be able to hold its own shape. For best results, until the dough is placed in the oven, keep it in a humid environment with a temperature of 24-28oC and cover it to prevent a dry skin from forming. THE BAKER SAYS :"Above all, be gentle with your dough. You have spent a lot of time allowing gas bubbles to form, don't destroy them through rough handling. The more gas bubbles you can maintain through the moulding and shaping processes, the better the cell structure in the final baked product". NOT READY TO BAKE - lightly press the dough with your finger, if the dough feels tight and springs completely back without leaving an indentation, the dough is under proved. If baked at this point, there will be lots of oven spring and splitting and tearing around the base of the loaf. READY TO BAKE - lightly press the dough with your finger, if the dough is soft, full of gas and springs back half way but leaves a partial indentation, the dough is ready to bake. If baked at this point, the dough should kick (expand) 25-50% in the oven and you should achieve great looking slash marks. 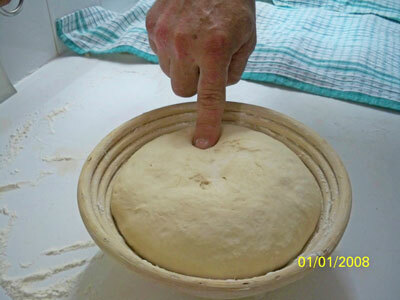 TOO LATE - lightly press the dough with your finger, if the dough is excessively soft, full of gas, does not spring back at all and leaves an indentation in the dough the same size as your finger, it is over proved. There will be very little oven kick, no movement in the slash marks and it will possibly collapse. There is no way to 'fix' an over proved dough. 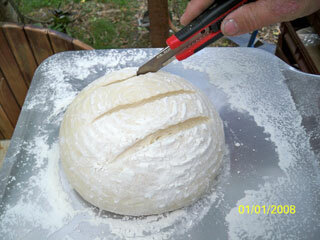 When you are confident your dough is ready, it is time to score or slash the dough to your desired pattern. There are two main reasons to score/slash your dough. 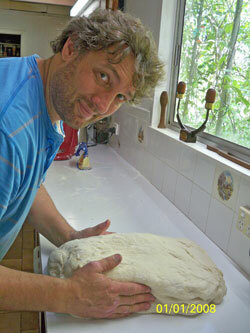 Firstly, it gives the dough a 'place' to expand. If you don't slash your loaves, they will still breakout somewhere - and probably look quite odd as a result – whereas, if you slash wisely, you can control your final loaf shape by allowing the dough to expand in that direction. 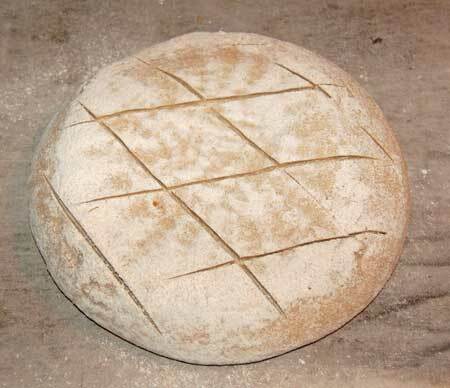 For instance: if you have a round loaf, you can make it come out slightly square or at least, quite level, by slashing across the top several times from one side to the other on the diagonal and then doing the same again from the opposite direction to create a criss-cross pattern. If you are after a flat round ball, slash the sides only (not across the top) or alternatively, if you want your loaf to be nice and perky, slash the top only and not the sides. Secondly, whilst not at all a practical consideration these days, slashing the top of your loaf celebrates both your personal style and the proud history of baking. Originally, baking was done in communal ovens and the lovely designs you see cut into traditional loaves were a way of identifying whose loaf was whose – in effect, they were the baker's signature. 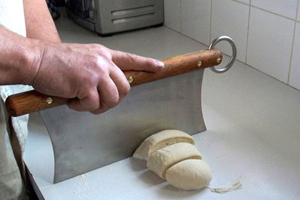 Special, curved-bladed scalpel-like knives (called lames), designed specifically for slashing artisan loaves, are available from bakery supply and cookware shops. The curved blade of a lame gives a particularly neat and helpful cut and doesn't 'tear' the dough as much as a normal knife, but they are certainly not essential for home baking. Whatever marks/slashes you decide upon, it is important that, whilst they need to be made with a firm hand (well, knife or lame, actually! 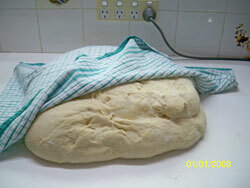 ), you don't go too deep or you will deflate the bread dough. A depth of about half a centimetre is ideal. The other major factor in successful bread making is the oven. 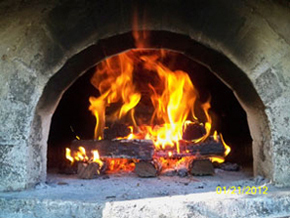 With a wood fired oven, you need to have created a solid preparatory fire and have built the oven temperature over time, so that the floor, the walls and the air are all well soaked with heat. If you are using a thermostat to monitor the temperature, you want to start preparing your oven when it holds at around 250oC – 275oC. 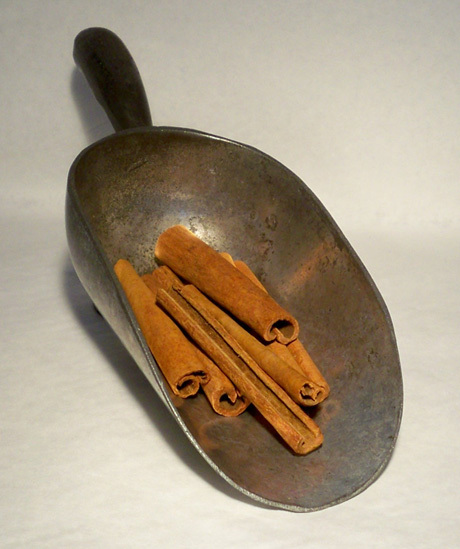 Remove the fire from the baking chamber, clean out the fine particles of wood and ash that remain, mop the floor over with a damp mop (or a damp rag attached to the end of a stick! 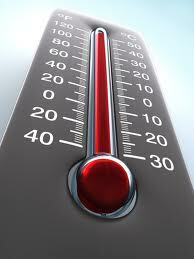 ), place the door on and allow the heat to equalize for about an hour. At that point in time, you are aiming for an air temperature of about 230oC to ensure a successful bread bake. The only real exception to this ideal temperature is if your dough is quite sweet – usually sweet breads/buns are baked at around 190-200 oC. The creation of steam is very important in the first stage of the baking cycle. 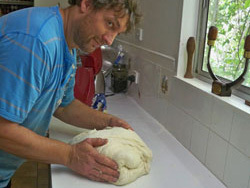 If possible, creating and maintaining a moist, steamy environment for the first 6-8 minutes of baking will allow maximum kick/expansion (as the dough hits the hot oven, it actually contracts slightly due to evaporation, so having a moist initial environment really helps the loaf expand to its maximum potential) and will also help keep the skin soft while the bread develops. This softness-for-longer will both give you more volume in your bread and ensure the crust, when it forms, is thin, shiny and crispy. THE BAKER SAYS: "There are many ways to create steam in your oven"
In the design and construction of my own oven I installed a steam injection system. This is basically a copper pipe with some brass sprinkler nozzles. 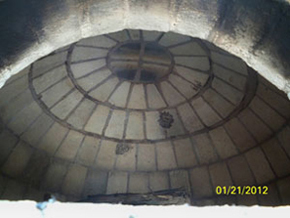 It is attached to the inside wall of the baking chamber with an external inlet. I usually connect this to the garden hose and turn it on for 3 seconds once the bread is loaded. A simpler but still effective option is to leave a cast iron pot or an old baking pan full of nuts and bolts and other small bits of metal in the oven while it is heating and then pour about a cup of boiling water over that just after you load the bread – the theory being that the metal pieces will hold lots of heat and so create maximum steam. Other people pre-heat a small frypan in the oven and add four or five ice cubes before baking; but at a bare minimum, grab yourself a spray bottle and spray a ½ cup or so of water into the oven after loading – you'll notice the difference. Whatever method you use to creat your steam, obviously, you want to get the oven shut as quickly as possible after that. A reasonable door seal will help maintain both the moisture content and the heat in the oven for as long as possible. If your door does not fit well, very well soaked and then wrung out cotton rags can be draped over the door edge to help create a seal. 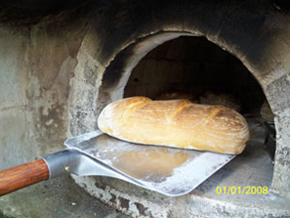 It is crucial that the oven door is not opened for at least 10-15 minutes after loading to ensure that the bread has started to colour and the initial high temp/high moisture kick has been achieved. After that time, it is OK to open the door quickly to check on your loaves. 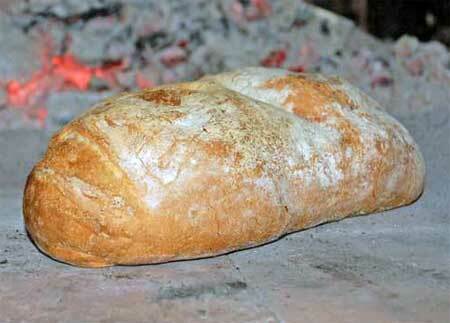 To be cooked through, bread needs to reach an internal temperature of 95oC. You can also test the loaves by picking them up (they should feel very light) and by tapping them (the crust should feel firm and they should make a nice 'hollow' sound). As a guide, a 500 gram loaf at 230oC should take aprox 25 mins to cook, bread rolls about 18 mins and fruit buns (which are cooked at a lower temperature because of their higher sugar content), about 25-30 minutes. Once the loaves/buns are removed from the oven, they need to be left out in the open to cool down. 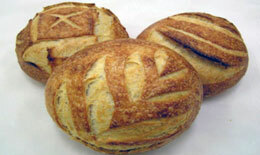 Perfectly cooked loaves will actually 'crackle' when taken out of the oven. They should then be placed on cooling racks or on a bread crate covered loosely with cotton material or on some other mesh/open surface that will allow air all around them. If bread is not allowed to cool in this manner, the crust will not reset correctly. 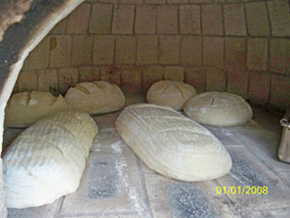 Most loaves come out of the oven with a good crust, however, during the cooling process, ALL loaves soften up again. 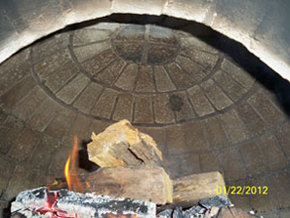 If allowed to cool in a well ventilated environment, the crust will reform perfectly. Get a good blaze going. Let it develop over time. Keep it stoked so heat builds. Watch the ceiling change colour. A clean ceiling indicates pizza temp (a bit above bread temp). Clean up quickly, put the door on, let the oven stabilise for up to an hour, then add the bread. 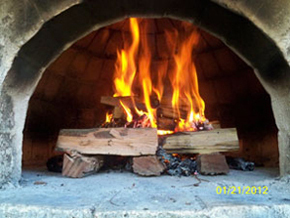 Create steam in your wood fired oven. Wait patiently for a good 10-15 minutes before opening your oven to check if the loaves are done. The BIG REVEAL will be worth the wait. 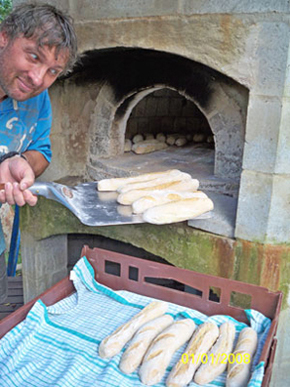 What about doing a second batch of buns or sweet bread – things that like a the slightly lower temperature? Whatever you do, make sure you allow the bread to cool completely. PRE FERMENT: Create a partial, 'advance mix' of either flour, water and yeast or of the whole dough and set aside for between 3 and 18 hours for the development of flavour and possibly textural elements in the bread. MIXING - AUTOLYSE: Mix the remaining flour and water and allow to sit for between 20 mins and 24 hours. This enhances the gluten development of the bread. MIXING - INCORPORATE: Add the remaining ingredients (yeast, salt, etc.) and mix together. 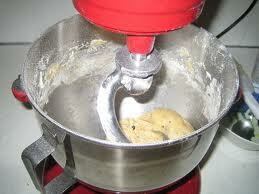 MIXING - DOUGH DEVELOPMENT: The serious mixing/kneading of the process. 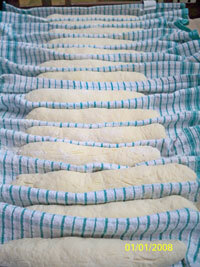 FIRST FERMENT: Depending on the type of dough development required (short, intensive, improved), this can last between 15 mins and 3 & ¾ hours and can be punctuated by the lifting and folding process. 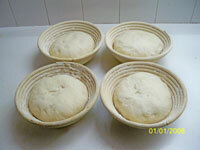 PRE MOULD: When the dough batch is divided into individual loaf/bun sizes and shapes. SECOND or INTERMEDIATE PROOF: The roughly shaped loaf/bun lumps are left to relax again before the final shape is formed. OVEN PREPARATION: Somewhere around this time, the oven needs to reach a suitable temperature (250-275°) so it can be prepared for baking and then left for the temperature in the oven to equalise down to the right temperature for baking. This usually takes about an hour. FINAL SHAPE: The rough loaf/bun shapes are gently coaxed into their final form. Their skin should be smooth and no tears or rips evident. PRESS TEST: The loaves/buns is 'poked' and the level of spring back observed to determine if they are ready for baking. 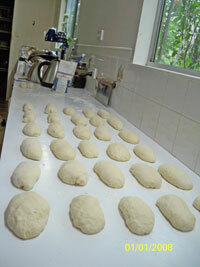 SLASH MARKS CREATED: The loaves/buns are slashed to assist/direct the way they will rise in the oven. 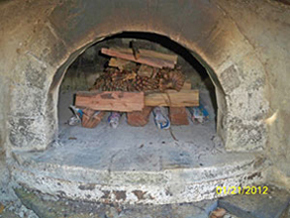 LOAD OVEN: Working as quickly as possible to avoid unnecessary heat loss, the loaves/buns are loaded into the oven. STEAM CREATION: Through a variety of methods, the oven environment is made moist and steamy for at least the first 6-8 minutes of baking. 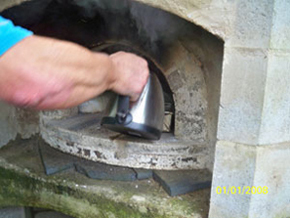 SEAL OVEN: The oven door is put in place. CHECK LOAVES: An internal temperature of around 95° is required. UNLOAD/COOL DOWN: Loaves/buns need to be unloaded onto baking racks or loosely folded tablecloths and left somewhere with good air circulation to cool down. 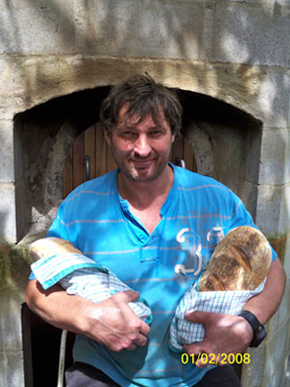 If you'd like to learn more, Scott regularly conducts 2 day courses in Artisan Bread Making through Holmsglen TAFE in Victoria. Contact Holmsglen direct for further details and 2012 course dates.